The Mirror Bright Polish Company was founded in 1901 by Frank Meguiar, Jr. to perfect the finishes on fine furniture and the newly introduced automobile. The passion continues today with a special line of products that protect and accentuate automobile finishes, derived from over 110 years of experience, research and development. 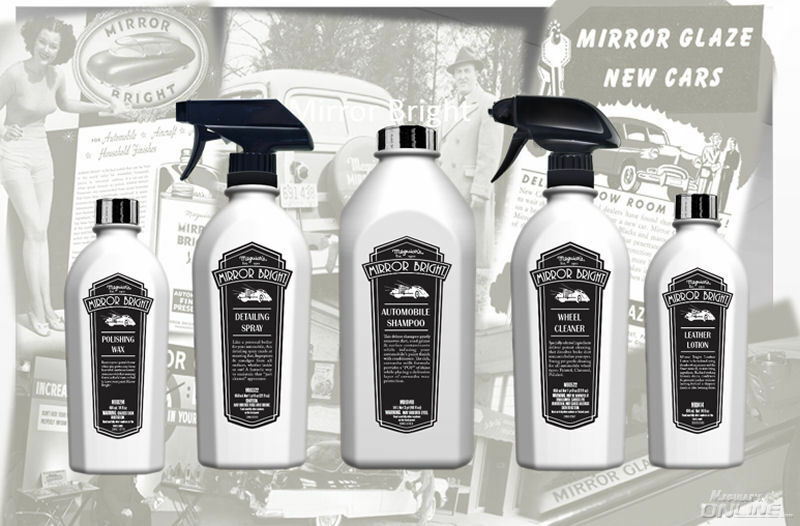 Drawing on our legacy and history, we are proud to announce our new Mirror Bright line of car care products. The distinctive bottles hearken back to our early days with glass bottles and metal screw off tops. Today's bottles might be plastic, but the metal screw off top is still with us, adding to that vintage feeling. With a craft made look and feel these premium products can help the next generation car guy easily choose a line of products that will address virtually every aspect of basic car care, while providing premium performance in all segments. For those experienced in car care, this line offers some unique performance characteristics that you will find not only appealing, but highly effective. Not merely repackaged or "tweaked" formulations of existing products, each product in the Mirror Bright line is a "clean sheet of paper" formula aimed at both premium performance and a premium user experience. 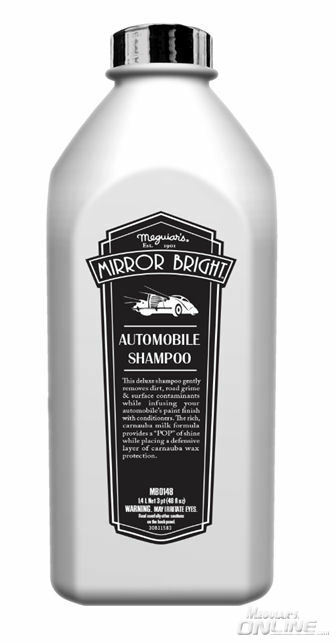 Mirror Bright™ Automobile Shampoo is formulated for all automobile finishes, using chemistry that's been refined by over 110 years of experience and R&D. Our rich, carnauba milk formula allows one to not only clean, but also wax while washing. Recommended for regular washing and as the perfect accompaniment to fortify the finish of Mirror Bright Polishing Wax. Mirror Bright™ Polishing Wax gently polishes painted finishes to reveal maximum gloss, depth of color & mirror-like reflections. Unique natural and synthetic ingredients deliver outstanding wax protection that locks in the shine. Safe for all shiny paint colors and types, including lacquers, enamels and clear coats. Can be hand applied, but maximum paint cleaning is realized when applied with our MT300, DA Power System or similar. Mirror Bright™ Detailing Spray gently cleans both exterior AND interior automobile surfaces and finishes. Our no-scratch formula is safe for all paint types, including lacquers, enamels and clear coats. Excellent for removing bird soiling, grime and other contaminants from paint finishes in-between washing. Mirror Bright Detailing Spray is also the smart choice for keeping automobile interiors clean and tidy, including instruments, gauges and screens! Mirror Bright™ Leather Lotion cleans, conditions and protects leather in one simple step. Gentle cleaners help remove dirt and grime that build up over time. Cocoa butter, jojoba oil & aloe condition and nourish leather leaving behind a soft and supple feel and look. UV Sunscreeners help protect leather from harmful UV rays helping to keep your leather looking good. With Mirror Bright Leather Lotion we make it easy to take care of your car's skin. Mirror Bright™ Wheel Cleaner is a sure bet for cleaning all automobile wheel types. Strong yet gentle cleaning comes from the use of pH balanced soaps and a special ingredient that dissolves brake dust and rust remnants. Excellent on: chrome, polished aluminum, painted, etc. etc. wheels. Good for motorcycles as well. Safe on brake components, too! The polishing wax really caught my attention with the beading and durability part. Close to UW but it corrects too. That's very impressive. Does the Mirror Bright wheel cleaner have color changing iron dissolving properties like DUB wheel cleaner? Yes it does. The product dispenses as a white foam, and it does have similar color changing iron dissolving chemistry. The color changing effect is always going to vary depending on how much iron deposits are actually on the wheel. Where does this product fit in with your "Ultimate" line? Do you consider this line superior?